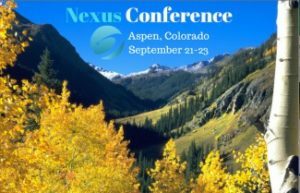 Catherine will be in Aspen next week to speak at the Nexus Conference. The conference is being hosted by The Nexus Institute – a non-profit entity created by the Nexus Team, the developers behind Nexus cryptocurrency. The primary Nexus creator is Colin Cantrell. Colin will introduce the conference and be joined by his father, Jim Cantrell, who is CEO of Vector Space Systems. The Nexus objective is to host an annual cryptocurrency/blockchain industry event that fits in the intellectual tradition of the Aspen Institute. In addition to an all star cast of speakers, participants will also have the opportunity to have an Aspen experience. Music events are planned with top musicians at the two hottest clubs in Aspen, Belly Up on Thursday night and Bootsy Bellows on Friday & Saturday. In addition, the Nexus Conference will be hosting a special screening of “Mully”, a heroic documentary of a man who has saved thousands of orphans’ lives in Kenya. The Director, Scott Haze, will introduce the film and take questions afterwards.